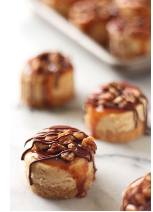 Mini Turtle Cheesecakes feature a thick graham cracker crust, vanilla cheesecake filling, and are topped with caramel, toasted pecans, and chocolate! Preheat the oven to 350°F. Lightly grease a 12 cup mini cheesecake pan with nonstick spray. Place the graham crackers in the bowl of a food processor and pulse until finely ground. Add in the melted butter and pulse until moistened. Divide the mixture among the cavities of the cheesecake pan, about 1 heaping tablespoon in each. Firmly press into the bottom of each cavity (a shot glass or other small object makes easy work of this). Bake the crusts for 5 minutes, or until fragrant. Remove from oven and reduce temperature to 325°F. In a large bowl, use an electric mixer to beat the cream cheese and sugar on medium-high speed until smooth and fluffy. Add the vanilla, cream, salt, and cinnamon and beat until smooth. Add the egg and beat until just combined. Divide the mixture among each cavity. Bake for about 18 minutes, or until set. Let cool to room temperature. Cover with plastic wrap and let chill for at least 3 hours or overnight. At this point the cheesecakes can be stored in an airtight container in the fridge for up to 3 days. Once chilled, top each cheesecake with a spoonful of caramel sauce, just enough to cover but not too much that it completely overflows. Press pecans into the caramel. Place the chocolate chips in a small heatproof bowl and microwave in 20 second bursts, stirring between bursts, until melted. Transfer to a small ziptop bag and snip a small hole in one corner. Drizzle the chocolate over the caramel and pecans. Return to the fridge to chill until ready to serve. Toast the pecans in a small skillet over medium-high heat or in a 325°F oven until aromatic and slightly darkened, about 5 to 10 minutes. 0 Response to "Mini Turtle Cheesecakes"